To keep me company and busy while I accompany my daughter who is in London, Ontario’s Children’s Hospital fighting leukaemia a thousand kilometres from home. Curl up with a cup of tea. I’m in a writing mood. 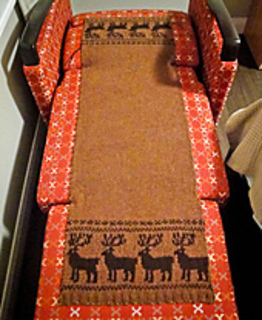 This project came about as I wondered around London Yarns looking for something to keep my hands busy as I had a 5-6 months hospital stay to look forward too. 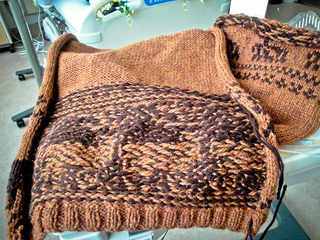 I spotted the early fall Vogue knitting, which I have at home, and remembered I wanted to knit one of those capes. 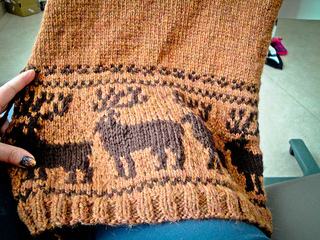 I flipped through it with the intention of knitting the cover project but the deer on this one caught my eye and reminded me of home, Thunder Bay, surrounded by dense forest, so full of deer they can be seen, not only in the outskirts but even among the businesses and streets of the intercity area at times. 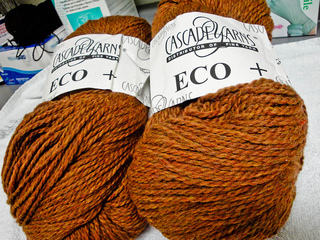 The yarn it called for was in the store but so pricey that the cost of the wrap would be over $100. I asked for help finding an alternative. The bulky Cascade was suggested. 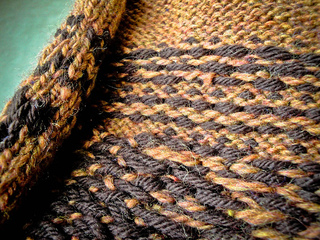 I was drawn to the warmth in the rich, heathery orange and picked the dark brown to go with it. The bulky only comes in these huge skeins and I didn’t need anything near that yardage for the brown so the knowledgeable sales lady suggested a skein of the worsted and just double it as that is what the bulky is anyway. 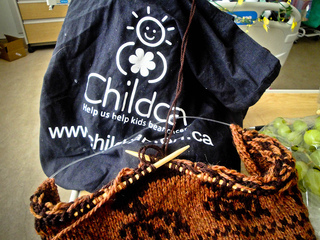 I happily left the store with the yarn, circulars and magazine, eager to cast on. So, what to do with the brown. How to use two balls together, in a two colour project, without creating a tangled mess? At home I would put each ball in a coffee can, the two brown on one side of me and the orange on the other, effectively keeping them untangled by wrapping the yarn in alternating directions as I go. As I was making the two brown balls the solution came to me at once. My sister had brought me a gift of a pretty mug, covered in teapots. The tin it came in had a thick cardboard circle, with two circle cutouts, in it. 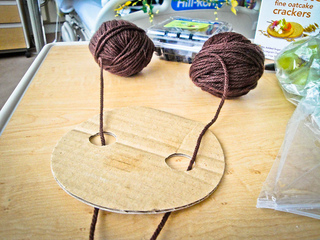 It wouldn’t be perfect but perhaps by threading the yarn through the holes would help keep the brown balls from tangling and felting together in the bag as I knit? Yes! It worked better than expected! I would occasionally push the cardboard circle down, close to the balls to reduce the chance of tangling. The brown went in the Childcan bag given to us a few days after Bronwyn was diagnosed, filled with childhood cancer awareness materials like pins and car magnets, a homemade pillowcase and bright quilt. The gigantic orange ball was placed in the blue bag another sister gave me from her etsy shop, Shift, made from Parallel coffee bags. Knitting commenced! 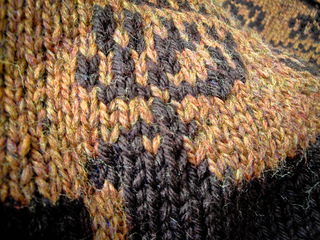 I quickly realized that only knitting one row of solid orange before each two-coloured section would mean cutting the brown and starting it again on the next row …… I don’t think so. Two rows of solid orange then, shall we? Of course. 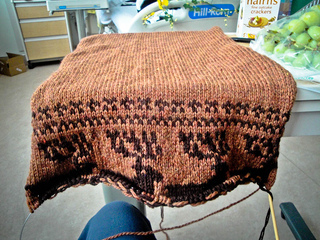 When I approached the halfway mark I realized, because, naturally, I didn’t read through the instructions before I started, that the pattern was asking that I make the second half separately and then kitchener the two halves together…. not going to happen. I was looking for a relatively stress-free project. 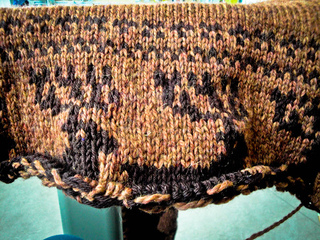 Once I finished the first half I measured the length after the pattern and then knit that much again before starting the pattern again, upside-down. 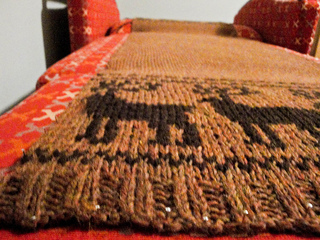 I just needed to make sure what I was knitting made the deer face each other when wrapped over my shoulders…. that feat required I rip out the first half of the antlers twice before I got it right. 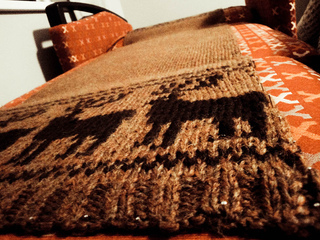 I enjoyed knitting this. It had just enough interest on ether end to keep me entertained but not so much attention was needed so as to keep me oblivious to what was happening around me. 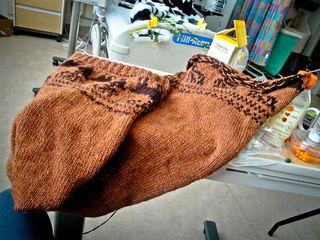 I spent many episodes watching Corrie St. with Bronwyn as I knit. One of the pictures shows you the one deer’s antlers that I messed up. He’s an unique individual! When the time came to block I discovered that the pullout chair in my room at Ronald McDonald House was the perfect place for it. I didn’t bother measuring it. I let it find it’s own length. Should have measured. It is several inches longer. 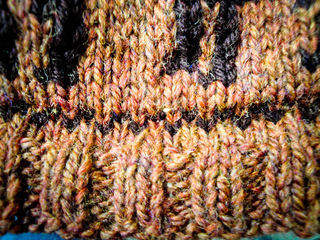 Before blocking the edges reached comfortably just below my elbows, like in the vogue picture. It now comes down to my wrists. I briefly thought about reblocking it …. very briefly. Extra length just means extra comfort. Lucky me! Now to add the ribbed boarder on each edge…. 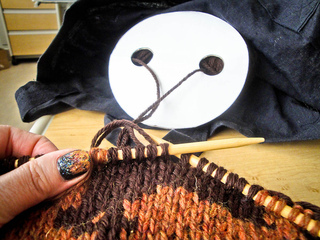 I don’t think my 5mm circulars are long enough anymore. 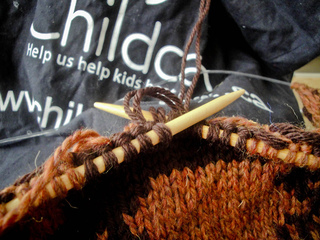 I did grab my knitpicks interchangables when we got to go home for a week in march. Maybe I can figure something out with those. Just more adventure!